“When you put an ERP system into a corporation, you change every job in that corporation because you are changing the information flow. You are invading the entire organization, and people need to realize the impact it is going to have.” (Campbell 2000) Usually the decision to implement a new information technology in general and an ERP system in particular depends on the economical needs of being competitive. Therefore, different reasons play a part like a fast responsiveness on customer demands, high flexibility and optimising costs through more effective processes (Doppler/Lauterburg 1994 : 41-42). Unfortunately, new information technology causes a fundamental change in the workplace. Thus, organisational change is always a challenge and often causes a rejection on the part of employees and management side since “people are resistant to change.” (Campbell 2000) But a technology implementation is only successful with the acceptance and the support of the individuals who have to work with it (Fisher/Wesolkowski 1999; Kakabadse/Kakabadse 2000 : 235; McNamara 1999). In total, companies have to take care of how they implement technology to receive the benefits of their information technology and have to assure the ability of the staff to use it (Fisher/Wesolkowski 1999). Consequently, a way to avoid resistance or at least to diminish rejection has to be found. 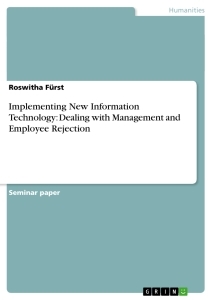 This assignment focuses on follow question: How can an organisation deal management’s and employee’s rejection toward implementing new information technology? Answering this question, it requires meeting two aspects: Firstly, the rejections and the reasons for resistance need to be discovered. This is important to understand rejection. Derived from this understanding, the author secondly lists suggestions for dealing with work force rejection. Thus, the possibilities as well on the personal side as on the organisational one shall be discussed. Organisations have to react to the demands and expectations among the customers, suppliers, stakeholders, management and employees. To fulfil this task, a balanced work force is essential to avoid reducing the productivity. Very often an organisation does not register desirable outcomes after the introduction of new technology because the management and employees react upon new technology with rejections which are worth to remove (APQC 1999, Freeman 1996 : 137). Only with the understanding of the different factors influencing the individuals‘ behaviour can the organisation solve the upcoming problems during the implementation because the problem can take by the root. According to Dickson/Simmons (1974) there exists five issues, which above all influence people’s behaviour. Firstly, people feel secure in definite roles, skills and distributed responsibilities. If boundaries of departments or divisions and functions shift as a result of the implementation, insecurity under the work force will occur because the old patterns are deleted (Doppler/Lauterburg 1994 : 212; Dickson/Simmons 1974 : 224). Secondly, people are used to thinking in an established pattern. Human behaviour is orientated on values, ethical codes and taboos. If this informal structure violated by change, the consequence is an annoyance on the formal structure of an organisation (Dickson/Simmons 1974 : 224; Bower/Sefert 1974 : 200; McNamara 1999). Thirdly, the personality and the cultural and milieu-specific background always influence the behaviour. For example, older people may be more resistant toward change than younger people. Also earlier experiences have a great impact of the attitude toward change (Dickson/Simmons 1974 : 224; Williams 1974 : 241). Fourthly, bad communication of the top management can negatively affect behaviour. That includes an negative manager attitude which is carried over to the personnel (Dickson/Simmons 1974 : 225; McNamara 1999). Fifthly, the method itself by which the new information system will be implemented is a great factor to the reaction (Dickson/Simmons 1974 : 225). Observing and analysing the rejection within an organisation, it is essential to pay attention to the different behavioural patterns to the operating personnel, operating management, top management and technical staff because their tasks and involvement in the new system is different. Then you can observe three kinds of rejection: aggression, projection and avoidance (figure 1) (Dickons/Simmons 1974 : 222-226). Aggression exists when people try to attack the information system. The result of such aggressive behaviour may be destroying parts of the systems, but the most ordinary way to express this feeling is to try beating the system by being better than the technology. Above all the non-clerical personnel and the operating management show these reactions. The first group, for instance, are above all responsible for the system input and consequently, they have the possibility of expressing their resistance by delivering wrong information (Dickson/Simmons 1974 : 225, 227). According to Koch (2002) ERP (Enterprise Resource Planning) tries to integrate all functions and departments across an organisation onto a single computer system, which can deliver all those various departments’ specific needs. It combines the needs of finance people, human resources an in the warehouse through a single database. Other definitions can be found in Jung/Cunningham (2001 : 7-8). Resistance of change means essentially an emotional blockade built up by individuals because they fear that their situation will deteriorate through this change (Steinmann/Schreyögg 1993 : 432). Comment of the author: Also the opposite can be the case, because older people possess more experience than younger people who are still afraid to do something wrong. Investigations prove that older people are generally interested in new technology, but they wish to be supported during an implementation (Fisher/Wesolkowski 1999). Non-clerical personnal belongs to the group of operating personnal and are also named ‚blue-collar‘ workers (Dickens/Simmons 1974 : 227). Operating management contents first-line supervisors up to middle management (Dickens/Simmons 1974 : 229). Clerical operating personnal is also known as ‚white-collar‘ workers. Essay zum Artikel "Information Systems and environmentally sustainable development: Energy Informatics and new directions for the IS community" von Watson et al.